Frost-tender, variable, vigorous climber with slender stems, 3-5-lobed leaves, to 15cm long, and bowl-shaped, red-purple flowers, to 13cm wide, with spreading corona filaments, purple-black at the base, white above, in summer and autumn, followed by ovoid green fruit. To 6m or more. [RHSE, Hilliers']. ‘It is shewy, but we cannot go quite so far as Mr. Sabine in thinking that “it has taken from each parent those properties of their respective flowers which conduce most to their beauty, and united them in itself,” as in our opinion either of the parents is more beautiful.’ [LBC no.573/1821]. 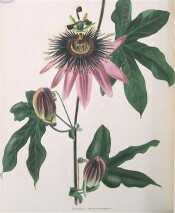 ‘[In the case of] the mule Passion-flower raised by Mr. Milne, equally distinct plants, P. racemosa and P. caerulea, have not only produced a healthy, but, for one generation at least, a fertile progeny, we think amount[s] to a conclusive proof that distinctive species of plants will breed together, and that therefore mere breeding together is not, as has been for a long time supposed, an absolute test of a species. But, admitting thus much, we still are of opinion, that, although really hybrid plants may be obtained by art, yet that they cannot be perpetuated beyond, at the most, three generations; and we are quite persuaded, that the numerous fertile productions among the tribes of Amaryllidae, which have been called hybrid, are either mere casual varieties of particular species, or raised, as in the genus Crinum, from a mixture of plants, not distinct species, but accidental aberrations from a common type.’ [BR f.848/1824]. First grown in 1820. [Hilliers']. Listed in all published catalogues [T.722/1843].